It was not until the start of this year's football season that my husband had started to watch Sunday football with our kindergartner. Every week our son understands the game a little more, but mostly I think he enjoys the time with his father. My husband is a huge fan of Tom Brady of the New England Patriots and, as a result, my son is too of course. 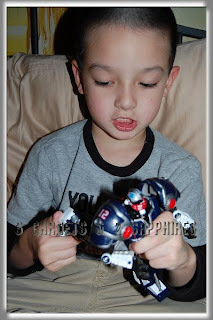 He also loves his Transformers, Power Rangers, Gobots, and other action figures. 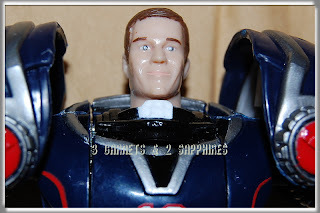 That is why I knew he would be crazy about this Tom Brady Pro-Bot from Toy Quest. In fact, my husband was pretty excited about it too. 1) At first glance, this toy appeared to be complicated. After further examination, it turns out that it is very detailed front and back and has many joints and moving parts, but in the end it is still an action figure. 2) I was especially fascinated by the hands because even the fingers were jointed. 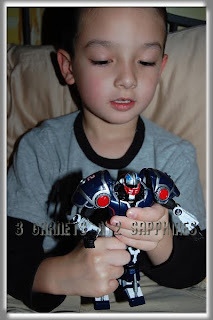 3) This toy has one trick and my son is extremely impressed by it. The player's head in full gear flips down while his uncovered head flips up. I have to admit that this is a neat feature, although at times, it is difficult to snap the head piece into place after rotating it. 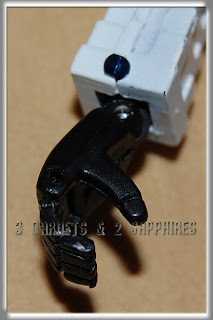 4) I was surprised that some of the robot figure's parts and limbs detached fairly easily. This did not bother my son because, in his mind, that is how robots are supposed to be. 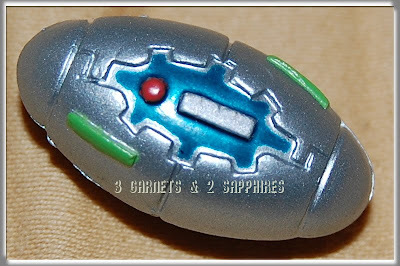 5) This robot figure comes with a small football like the one shown below. Although it makes sense for an NFL player figure to have a football, it did not really fit with the toy, at least not as far as a child is concerned. There was no place to store the football and the player's hand did not open wide enough to grasp it. I ended up putting ours away in a safe place because I knew it would get lost quickly. 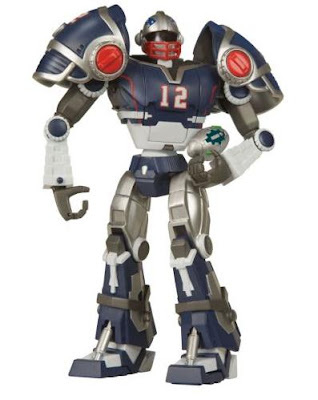 I think this robot NFL figure is a fitting toy for a young football fan. It has a high coolness factor. 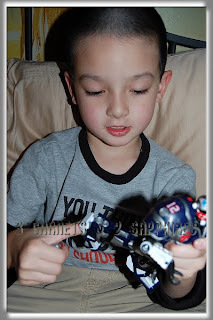 My son is already asking me for another Pro-Bot from a different team so that he can play a game of football with them. Having said that, if you are purchasing this figure as a collector's item, I recommend that you keep it in the package, which comes with an official holographic NFL licensed seal. 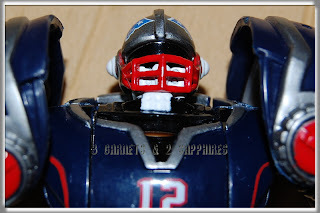 You should be able to find NFL Pro-Bots at many retailers of NFL licensed toys, such as Toys R Us. If you cannot find your team locally, you may have better luck purchasing online. Thank you to Toy Quest for providing us with both a review product and a contest prize free of charge. 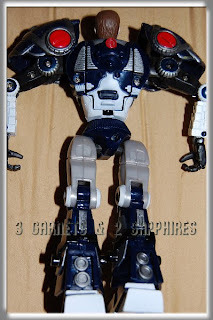 One lucky reader will receive their choice of one in-stock 6" NFL Pro-Bot. Leave a comment telling me which of the following NFL players is your favorite . . .
You MUST do this to be eligible to win this contest. 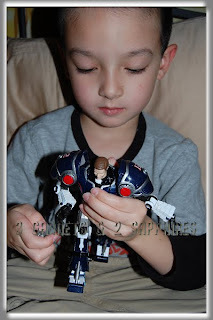 3) For 10 extra entries, blog about this contest linking back to this post AND Toy Quest. Then come back here and leave TEN separate comments with the link to your blog post. 5) For 2 extra entries, share the link to this contest post on Facebook, making sure to show a thumbnail of the product or the sponsor's logo. Then leave TWO separate comments with the link to your Facebook profile.